Happy New Year from everyone at Korean-Arts! 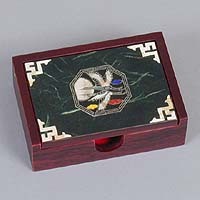 We have recently added a new line of lacquered wood business card cases with inlaid designs of flying cranes, the symbol for immortality; wild orchids, plum blossoms and bamboo, symbols representing the Four Gracious Plants in Korean lore, or more commonly known as the four seasons in modern times. Plum blossoms represent courage, the wild orchid stands for refinement, and bamboo represents integrity. Read more about the four seasons symbols here! The boxes have the designs inlaid into the lid and a lacquered finish over rice paper that gives them a unique look. The inside is lined with felt for an added touch of elegance. See all the new card cases here or all our new items here! Business card cases for people on the go! 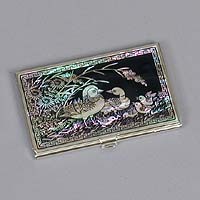 These stainless steel cases come in four new designs including a pair of ducks pictured to the right, which stands for the both a premiere ranking, and happiness in marriage because ducks mate for life, a pair of peacocks design, which also is a revered animal in Korea because they mate for life. The other designs are the Four Gracious Plants although they are now more commonly called the four seasons, and include plum blossoms which represent courage, the orchid which stands for refinement, chrysanthemums which are a sign of a productive, and fruitful life, and bamboo which represents integrity. These symbols are believed to bring these gracious qualities to the bearer of the card case as well. The final design has the symbols for long life and happiness written in Chinese script which was the sole writing system in Korea until the 15th Century when King Sejong invented the Korean alphabet. The inside cover of the cases is polished stainless and doubles as a mirror. See the new stainless card cases here or all our new items here! 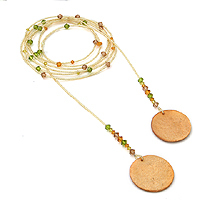 This is the month of the wrap, a necklace that is open on the ends and wraps around the neck to the desired length. We have three new styles; the Mother of Pearl Crystal Wrap to the left which has two discs of mother of pearl and a bead necklace interspersed with colored synthetic crystals, the Black Pearl Wrap, which has two discs of white-pearlescent mother of pearl, and a necklace with pearls from shades of white to black, and the Agate Butterfly Wrap with two butterflies made of agate on the ends and a necklace of amethyst, green onyx and other stones. See them all here! We have stocked up on our hearts, as they always seem to be popular at this time of year, and put them on sale to boot. All three of our heart-shaped pendants, three styles of couple’s cups, wedding couple dolls and our most popular items, the wedding ducks are on sale at 25% off the regular price until February 14th. Supplies may be limited so order early! Wedding ducks are not only popular at weddings but after the wedding as well. They play an important part in the Korean wedding ceremony and after the wedding, the ducks are placed in a conspicuous place in the house, and their position tells of the state of the relationship; nose to nose means things are peachy and tail to tail means the couple is probably having a tiff. We have heard rumors that wedding couple dolls have a similar meaning but their positioning indicates a somewhat more amorous intent, but we are not sure we believe it. In any case, they are cute, and they are on sale as well. They make great wedding favors. Couple’s Cups are a set of cups with one cup being slightly larger for the man and the other, smaller and more dainty for the woman, a little old fashioned perhaps, but cute nevertheless. See all our on sale items here! 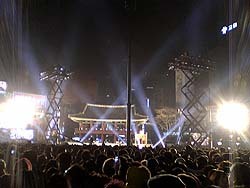 The show at Jong-gak (종각) New Year’s Eve. Korea, and particularly Seoul, is dynamic, there is no doubt about it. When you walk around the city you can feel the energy, we think even more so than many other large cities. Well, if the energy is high on normal days, that energy is multiplied tenfold during the New Year’s Eve celebration. The New Year is an important time in Korea and Koreans celebrate the lunar New Year by braving gridlock traffic to travel to their hometowns and gather with their families. The lunar New Year changes each year on the solar calendar, and this year the holiday starts on February 17, New Year’s day is on the 18th and the 19th is a day off too. 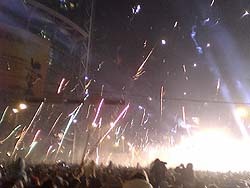 The solar New Year, on the other hand, is celebrated with a little more vitality. 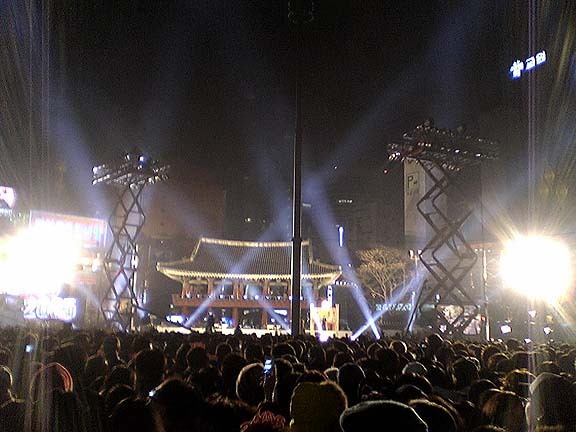 Hundreds of thousands, perhaps millions, of people, gather at Jong-gak, the historic bell near the city center where pop concerts and shows are performed all evening until the midnight hour when the mayor of Seoul, rings the bell and by doing so, rings in the New Year. The area around Jong-gak (종각) minutes after midnight. We have been to Time’s Square, we have seen the fireworks exploding the length of the world’s tallest building in Taipei, but none of those compare to the scene at Jong-gak at midnight on December 31st. Virtually every person has a roman candle, which are sold by the armload all along the streets, and as the hour approaches more and more people begin firing them. At exactly midnight, the sky is aflame with fireworks, the air is thick with smoke and the result is the most spectacular fireworks display you are likely to ever see. We wear hats and protective glasses and recommend you do the same should you go. If you happen to be in Seoul near the end of the year, it is a show that should not be missed. If you cannot make it, check out the video. It is a bit on the large side at 6.5mb but only takes about 10 seconds to download on a high speed connection - Korea has the highest speed broadband connections in the world so we are a bit spoiled. For those with a dialup connection it may take too long to download. View the video here – enjoy! We at Korean-Arts appreciate your patronage and do not wish to send unsolicited mail. We send our newsletter once to each new customer, and monthly* to continued subscribers. If you would like to be removed from our mailing list for any reason, click on the link below and send the new email that appears. Please unsubscribe me from your mailing list. Should a new email message not appear, reply to this email with the word “UNSUBSCRIBE” in the subject line. Questions or Comments: We would love to hear from you. If you would like to ask any questions about the arts of Korea, or have any comments contact us at. *Generally, we send a newsletter every month, but may delay it until we have new items or specials. Copyright © 2002-2007 Korean-Arts.com All rights reserved.